I stopped buying new CD’s and books a few years ago. I did this because I lost my income, but I must add to this that I didn’t really mind it. All my life a had been buying so much stuff that I only listened to once and then put on a shelf or gave it away. I also reduced the buying of second hand records, which I didn’t really mind either, for the same reasons. It might be a way to comfort myself, but it seemed to me that my change of habits happened around a time when the whole record scene changed too. It became more and more difficult to discover interesting records f0or acceptable prices. When the amount of incoming records reduced dramatically, I finally had the time to close listen to all the records I had accumulated. And of course the Internet provided me with all the music I ever wanted to hear, and much more. Every now and I then I heard new music that I liked so much that I bought a CD, but I soon discovered that I rarely played these. Most of the CD’s I bought in the past few years were for my children or gifts for friends. If I was missing out on important CD’s I didn’t even know it. There was one exception: Dutch Rare Groove. 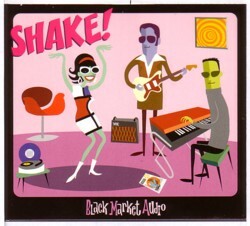 Dutch Rare Groove is a compilation of funky songs recorded by Dutch musicians in the 60’s and 70’s, and the guys from Black Audio Market, who are responsible for this CD, did a really great job. I listened to the CD but didn’t buy it. Not only for money reasons, but also because I had been collecting Dutch Soul records for years. I had half of the records on this CD and some that should have been on it. I felt a bit pissed that I was not asked to contribute some ideas to this project. Or maybe I felt pissed because I had done no effort to be aware of the fact that this CD was in the making. I have a big ego that is easily pissed, and it is not always easy to find out why. Often I don’t even try. I hoped that I would find a second hand copy of the CD soon and tried not think of it. Recently I got in contact with Bert Taken, one of the Black Audio Market men, because of a new project they are working on. 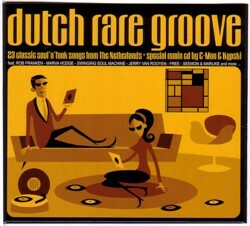 He turned out to be a very nice guy and with his first mail he send me all his CD’S, including the Dutch Rare Groove. I received the gift with a mixture of great pleasure and shame. I should have bought these CD’s myself! This is the stuff I love! I am a fan, a consumer, a lover of music, not a producer. My jealousy is embarrassing and ridiculous. The two CD’s by Black Audio Market are different from what I thought them to be, based on what I had heard here and there. It are up tempo songs, with a tune you can whistle, and very cool gimmicks. 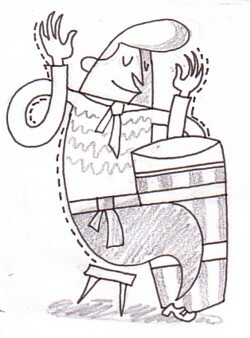 The CD’s are in every aspect a labour of love, with great artwork (by Bert Taken ). When my love saw me reading the CD-booklets, she took one look and said: that is your kind of eyecandy, ain’t it? To top off the surprise package he send me, Bert sent an original drawing with his letter. Man, do I love it when people turn my world upside down. No music today here. 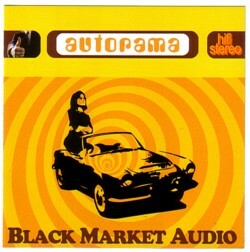 But you can find samples of Black Market Audio here.